The Greater Mekong Subregion (GMS) Economic Cooperation Program began its third decade in 2012. Since its inception, the program has achieved noteworthy successes in fostering cooperation in a region that, at the commencement of the program, was emerging from a period of prolonged conflict. The program has built a reputation as a flexible, results-oriented, project-delivering vehicle for promoting regional cooperation and contributing to economic growth and poverty reduction as well as to the provision of regional public goods. Increased recognition of the benefits of regional cooperation is manifested in the evolution of regionalism both in Asia and more broadly. New institutions have emerged while others have become more vigorous. Within this context of evolving regionalism, the GMS Program remains highly relevant. The start of a new decade was an opportune time for the GMS Program to assess its achievements and develop a new strategic framework. 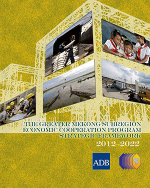 The Greater Mekong Subregion Strategic Framework 2012–2022 builds on the substantial progress the program has made and the likely global and regional trends. It also builds on the commitment that member countries have made in their national development plans to the promotion of regional integration, and will guide the efforts of member countries to steer the program during the new decade to the next level in terms of results. The Regional Investment Framework translates the strategic directions of the GMS Strategic Framework into a pipeline of investment and technical assistance projects for the third decade of the GMS Program, from 2013 to 2022.